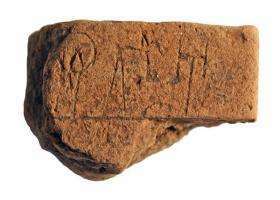 (PhysOrg.com) -- In a study to be published this month in the Proceedings of the Athens Archaeological Society, archaeologist Michael Cosmopoulos of the University of Missouri-St. Louis shares his discovery of a clay tablet showing the earliest known writing in Europe. Located in the southwestern corner of Greece, the town where this discovery took place is Iklaina. This town dates back to the Mycenaean period of 1500 BC to 100 BC, and around 1400 BC was conquered by King Nestor. Cosmopoulos has been actively excavating this site for 11 years and has found evidence of a Mycenaean palace, including colorful murals, Cyclopean walls, and an elaborate drainage system made from clay pipes. However, this tablet has been his most unexpected find. Tablets of this nature were made from clay which was allowed to dry in the sun, making them very brittle and easily destroyed. The tablet they discovered however, had been thrown in a garbage pit and burned, thus firing the clay and leaving it preserved. The estimated 3,500 year-old tablet only measures around one inch by one and a half inches, but shows various symbols of Linear B, an ancient Greek writing consisting of 87 signs, each signifying one syllable. It appears that the Mycenaeans used this tablet to record economic matters of interest to those in the ruling party. From what the researchers can distinguish, the front of the tablet shows markings appearing to for a verb relating to manufacturing. The back of this small tablet shows a list with numbers and names. While this is not the oldest writing ever found, it is the earliest example of writing found in Europe. Writing found in China, Egypt, and Mesopotamia is believed to date back to 3,000 BC. Originally believed that such tablets were only found in major state capitals or the time period, this find brings to that they were also used in what are considered second-tier towns. Researchers are hoping this find will help to shed some light on how these ancient Greek kingdoms were run. Is this text really the "Oldest evidence of writing in Europe"? It's the oldest readable writing in Europe but not the oldest script, Linear A and Cretan Hieroglyphic are earlier examples but not deciphered. Those are not Greek kingdoms! During these period there was no Greece and it's ridiculous to try to connect them with modern Greece or even with ancient Greece.